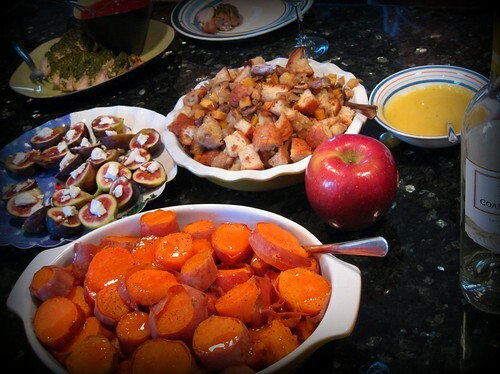 Just because it’s the holidays there’s no reason to abandon your healthy ways and pig out. Here are a few tips to keeping trim with seasonal food around. It’s not easy to stay on a diet when all your relatives are around and grandma just put out another tray of pastries. Whenever it’s Christmas, Thanksgiving, or any other holiday time we all tend to forget that we’re on a diet, and spend the next few weeks frantically trying to lose that extra ‘Christmas spirit’ we put on over the holidays. And try healthier alternatives to the heavy, fatty recipes out there. Keep your own snacks on you. When everyone’s digging into chocolates and pretzels you don’t have to be left out. Bring along your own little collection of nuts or granola treats to keep your calorie intake within acceptable limits. You don’t have to make a big deal about it – simply keep them in your pocket and snack on them when you feel peckish. This will help you avoid the temptation of the snack platter. Help to prepare the meals. If you are in charge it’s easy to make sure you substitute low fat ingredients for full cream and butter. If you are not the main chef, however, you’ll have to wiggle your way into the kitchen and impose your own nutrition rules. Bring your own low-fat cream and butter if you think you can get the cook to use them. This will help cut down on the calories for things you just have to eat. Go for more walks. It is easy to let your exercise schedule slip a little during the holidays, but that’s no excuse to sit around on the couch all day. Make sure you get out of the house at least once a day and go for a 30 minute brisk walk to get your blood pumping and burn off some calories. Simply keeping your activity levels up will prevent your body from going into ‘hibernation’ mode and starting to store food for the lean months. Cut down on the alcohol. If it’s not a festive season without booze, you can at least make sure you only drink types of alcohol that are low in calories. Choose white wine over beer, and avoid eggnog at all costs – it is filled with cream and bad things that will put pounds on your thighs before you even notice. Drink lots of water. Specifically, drink a large glass of water before big meals. When everyone’s sitting down for the big Sunday feast, down a pint of water and you’ll feel full before the meal even starts. This will help you to keep your portion sizes small, and make sure that you only eat as much food as you need, and not as much as you’d like to eat. Make healthier meals during the holidays. How about a Thanksgiving style roasted root veggie dish baked in the oven with lots of herbs? Or take the devilish potato gratin and make it healthy too. Our favorite is by far the butternut squash with Parmesan pudding. It sounds like it would be bad for you, but it isn't!